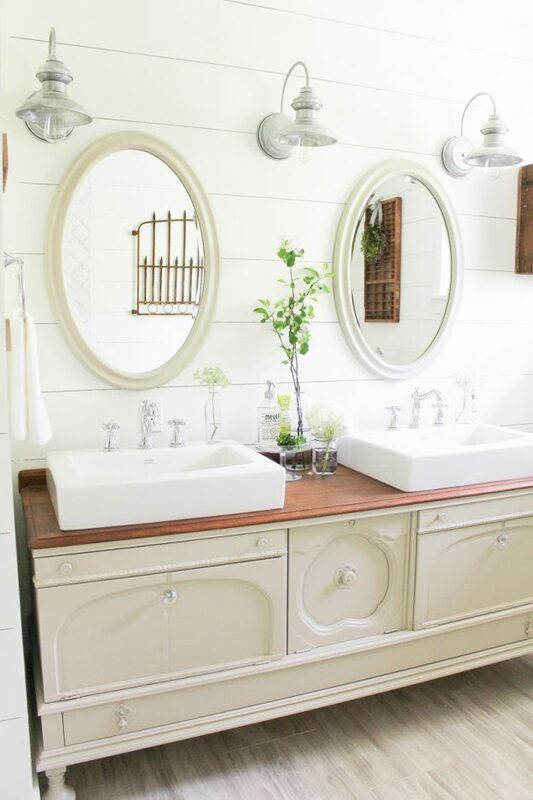 Need farmhouse bathroom ideas? Bathrooms can be some of the most expensive rooms to remodel. 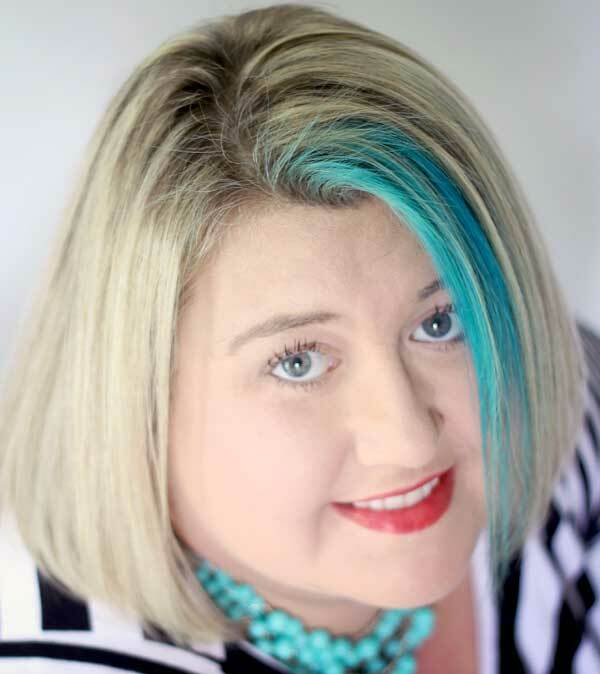 Sometimes just a quick update can make a world of difference. 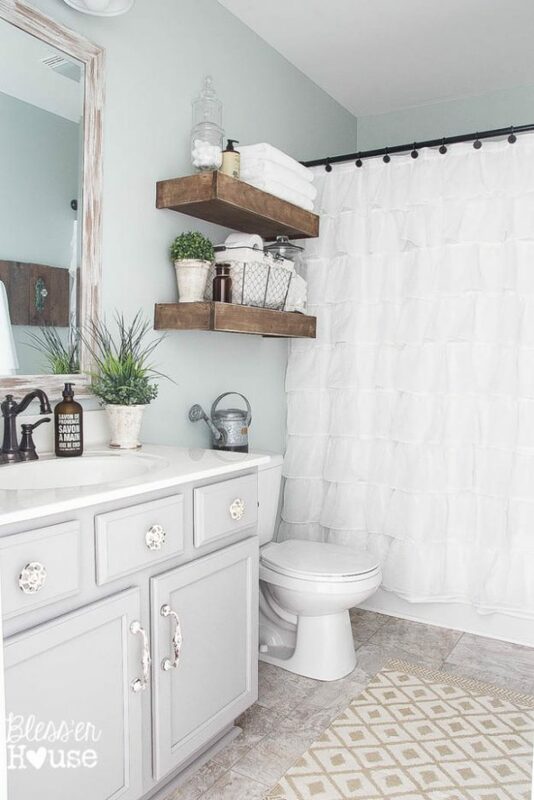 These farmhouse bathroom update ideas are budget friendly and all DIY ideas you can actually pull off yourself in less than a weekend! Don’t want to DIY a mirror from scratch? Frame out your existing mirror with this easy idea from Cherished Bliss. Have an old buffet or dresser in your garage? 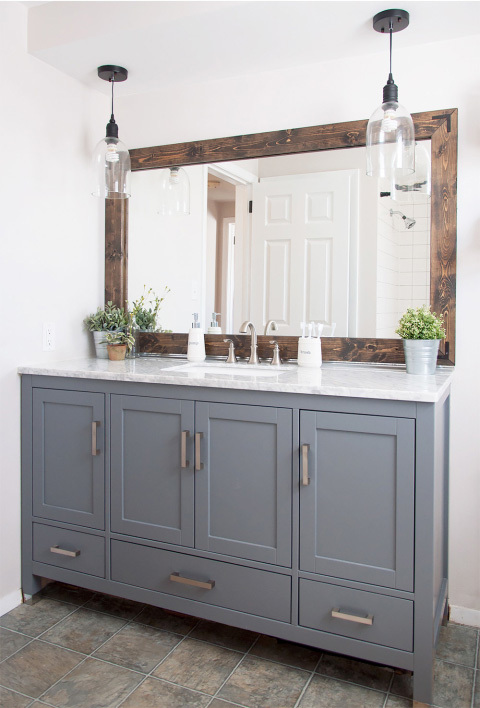 Turn it into a farmhouse bathroom vanity like this one from Making it in the Mountains! Even if you find a deal on Craigslist, it’s still cheaper than buying a fancy vanity brand new. Is there anything more farmhouse than grain sack? 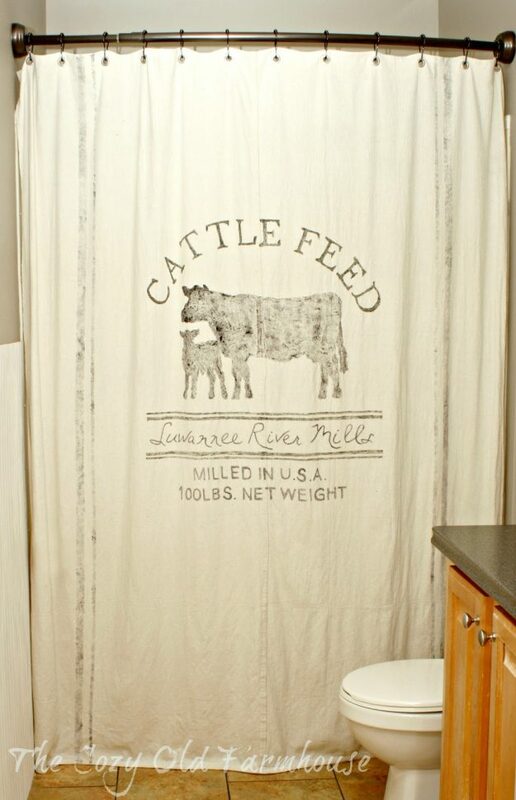 This DIY shower curtain from The Cozy Old Farmhouse was made with drop cloth!?! It’s gorgeous! Take some barn wood + add in some mason jars and you get a farmhouse bathroom organizer that is as pretty as it is functional! 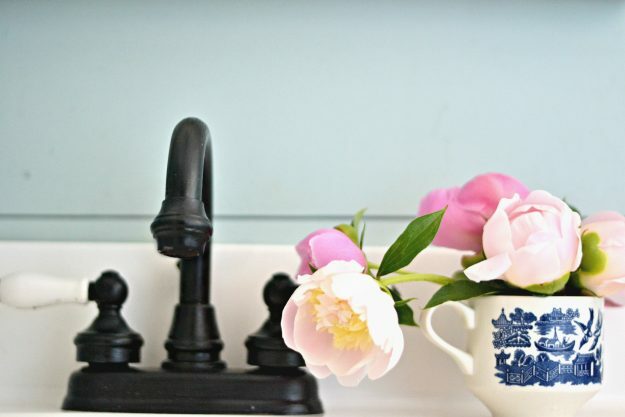 Did you know that you can paint faucets? Me, either! This quick update is so easy that you don’t even have to take out the faucet! 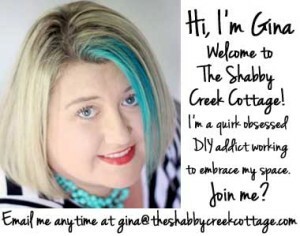 Don’t want to pick up a power tool or paint brush? Just change out some accessories! 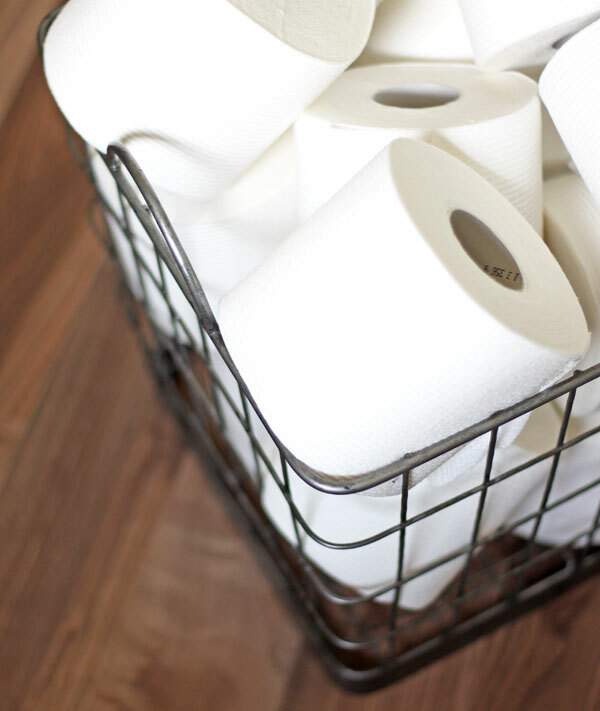 This is a basket we use in our bathroom, one that adds a lot of charm with zero effort. Paint can be one of the cheapest, easiest & fastest ways to give any space a makeover – and this room is a great example of that! These gray walls are gorgeous! 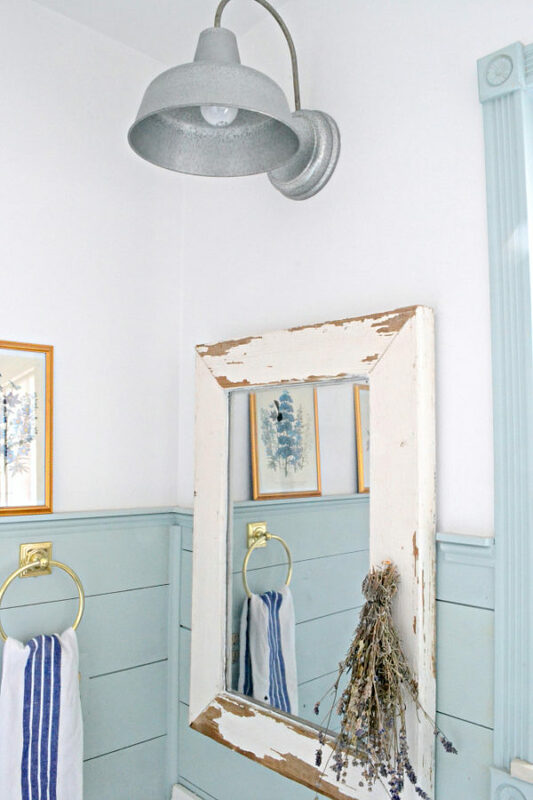 No matter if you’re buying a cute accessory or painting walls, a little bit can go a long way in a farmhouse bathroom makeover. Such a fun round up! Thanks for including my Mason Jars! 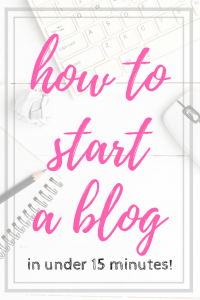 The mason jars were my favorite thing in this post! 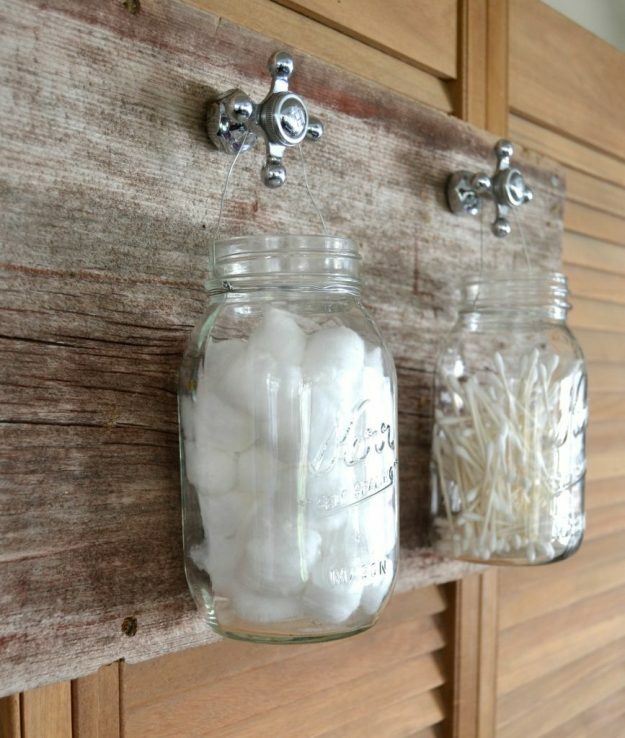 Such a cute and simple little “rustic” thing you can do for your bathroom, I love it. I really love the farmhouse look/decor. I want to turn my little house into farmhouse decor.